The Self-Absorbing Man: Ultimate Spider-Man — Spidey at Last! Spider-Man. 2010. Ink and watercolor on bristol board, 11 × 17″. 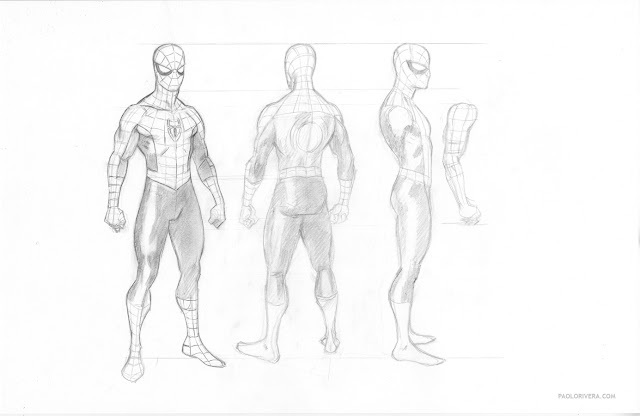 Despite having a few less webs, this is fairly close to my typical Spidey drawing. As noted previously, the main differences in this younger version have to do with proportion—the head, hands, and feet are all slightly larger, but the overall anatomy wasn't altered. For the show, they ended up removing the webbing from the arm altogether, a decision that probably saved countless animation hours. The whole exercise proved very useful in my own work, since I typically don't do character studies that are this refined. Now I often refer to this image when I draw Spidey (especially for the webbing, which can be tricky). And thus concludes 2 straight weeks of animated Spidey goodness. I hope you've enjoyed the behind-the-scenes peek. I've included links to the other studies below. Have a great weekend! Hi Paolo. Had the pleasure of meeting you at last year’s NY Comicon. 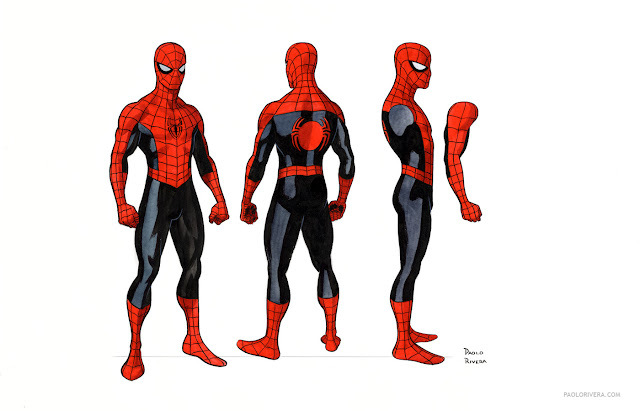 We chatted briefly about the Timm/Dini DC cartoons, but had no idea you had done designs for the new Spidey show! Nice work! Ultimate is without a doubt the slickest animated Spider-Man ever, but a bit ADD for my taste. I miss the “Spectacular” series which – despite the gentle reboot – had a nice look and felt the most like the Spidey I know and love. Aside from a nostalgic love of the 60’s series, its probably my favorite of the animated iterations. What did you think of “Spectacular” and which is your fave? I grew up on the 90s show, so that's what I remember best. I haven't seen the "Spectacular" series, but I always liked the designs from it. I have the 60s series on DVD, but I haven't watched all of them. As for the current iteration, I like the general look, but I think the age range skews a little low. I remember my childhood very well, and I didn't like anything that was "made for kids." X-Men and Spider-Man were cool for cool's sake. And I think that's why Batman the animated series has stood the test of time. It's as stylish and high-craft now as it was 20 years ago. Well, I watched cartoons until well after it was cool to do so. I'm 31 now... and I'll never stop watching them. Thanks for the kind words! That's why the show is so good, it has the best people behind! It was awesome to be a part of it. Glad they asked!